Lenda is the world’s most successful female bodybuilder to date, having won the Ms Olympia title 8-times. Lenda was born in 1962 in Detroit, Michigan. At Henry Ford High School, Murray was both a record-holding sprinter and varsity cheerleader. She went on to attend Western Michigan University, earning a degree in political science. Lenda took to the bodybuilding stage in 1985. She rose quickly through the ranks, soon winning contests at the state and regional levels. In 1989, she earned her professional status at the IFBB North American Championships and soon became a regular presence in bodybuilding magazines. On November 24, 1990, Lenda became Ms. Olympia, a title she would hold for most of the following decade. 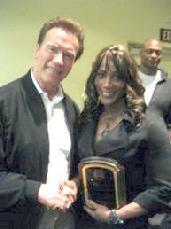 She has been featured in such mass-market publications as Sports Illustrated, Ebony, Mademoiselle, and Vanity Fair and her physique has become the standard against which professional female bodybuilders are now judged – an hourglass figure, with broad shoulders tapering into a V-shaped torso mirrored by a proportionally-developed lower body. Lenda has done color commentary for bodybuilding events on ESPN and is a successful contest promoter and host of the Annual NPC Lenda Murray Bodybuilding, Figure and Bikini Championships in Norfolk, Virginia. Her wealth of experience in athletics and entertainment makes her a worthy vessel to promote the event, giving athletes recognition for getting into the best shape of their lives. Lenda currently lives in Playa Del Rey, California with her husband Urel McGill. She volunteers her time working with substance abuse; is the owner of Operation Boot Camp; and is the Vice President of Private Trainers Association.